Iridium Communications’ recent successful second launch of its next-generation network, Iridium NEXT, has further implemented a space-based automatic dependent surveillance–broadcast (ADS-B) developed by Aireon. This payload of 10 satellites deployed into Low Earth Orbit (LEO) approximately one hour after a SpaceX Falcon 9 rocket lifted off from Vandenberg Air Force Base in California on Sunday, June 25. With this launch complete, there are now 20 Iridium NEXT satellites in orbit, establishing the infrastructure for technologies such as Iridium Certus and Aireon’s ADS-B aircraft tracking and surveillance service. The launch increased the total number of Aireon payloads in orbit to 20 with another 55 destined for space in a series of six additional launches planned for the next 12 months. Aireon’s technology will provide real-time global air traffic surveillance and tracking, which will be designed to bring aircraft visibility to all regions of the planet. Since the successful January 14, 2017 launch, Iridium has integrated its new satellites into the operational constellation. According to the company, the first eight operational Iridium NEXT satellites are already providing superior call quality and faster data speeds with increased capacity to its customers. The two additional satellites from the first launch are continuing to drift to their operational orbital plane, where upon arrival they will begin providing service. Iridium will test and integrate the satellites from this most recent launch into the constellation over the coming weeks. Just as with the first launch, Iridium and Thales Alenia Space teams will complete on-orbit testing and validation. Iridium will send five of the 10 satellites from this launch to adjacent orbits, or planes, to optimize the network deployment and ensure 11 operational satellites, and at least one in-orbit spare, are in each of Iridium’s six polar orbiting planes following full deployment. In total, 81 new satellites are being built, with nine serving as on-orbit spares and six as ground spares. The January launch of 10 Iridium NEXT satellites was reported by Inside GNSS as a step toward helping to implement an ADS-B developed by Aireon, in partnership with leading Air Navigation Service Providers (ANSPs) from around the world, and designed to provide real-time GNSS tracking of aircraft over oceanic regions. SpaceX’s Falcon 9 rocket is delivering 10 satellites to LEO for Iridium, a global mobile voice and data satellite communications company with headquarters in McLean, Virginia. 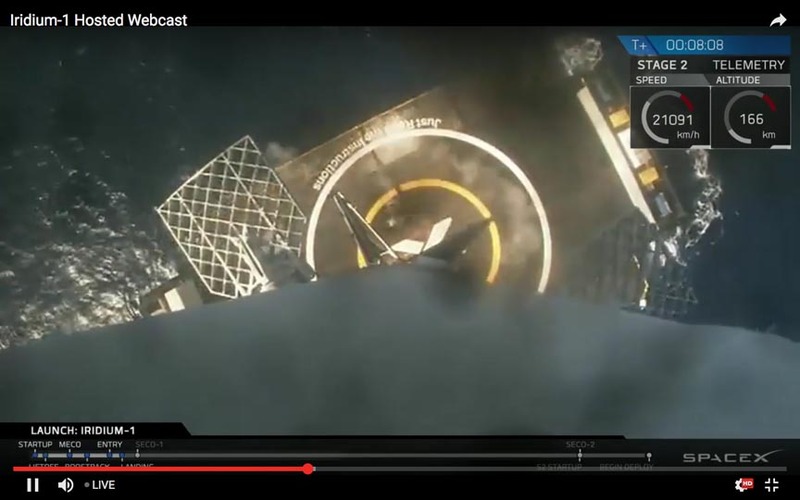 SpaceX succeeded in bringing its first stage back to a landing on an unmanned autonomous spaceport drone ship (ASDS, named "Just Read the Instructions") off the California coast. This maneuver required use of GPS, inertial, and other positioning/navigation technologies. The Iridium NEXT launch on June 25 capped off two successful SpaceX missions to space that weekend. First it launched a communications satellite into orbit from Kennedy Space Center in Florida on June 23, then the private space outfit completed its run with the clean launch from California’s Vandenberg Air Force Base two days later. The June 25 launch was SpaceX’s ninth this year, and the company has surpassed the record for the most launches in a single year, which it had set last year. While the Iridium NEXT program has several goals, a key one is to implement an ADS-B designed to provide real-time GNSS tracking of aircraft over oceanic regions. This would eliminate "black zones" where commercial airplanes can’t be tracked by providing global real-time surveillance of all flights. Such a system would prevent situations like the one that occurred when a Malaysia Airlines flight vanished three years ago over the Indian Ocean. For more on that incident along with standards proposed by the International Civil Aviation Organization (ICAO), click here to read an article published earlier by Inside GNSS.